I recently discussed how preferred shares work as an introduction to preferred shares for fixed income. As it turns out, the timing was good as Dividend Ninja made a purchase of preferred shares bringing up the question; Why not buy the common shares? Since the purchase of preferred shares was Power Financial TSE:PWF and they happen to have a common share with a near dividend yield, the dilemma was understandable. As you can see, the yield is very close but the investments have a different purpose in a portfolio. It’s not the company but the purpose that matters in this case. If you were just looking at comparing the investments then the pro’s and con’s would stack up like this. This is where the decision is really made. When you have a portfolio of a certain size, you start distributing your risks through asset diversification such as common stocks, fixed income, and cash. 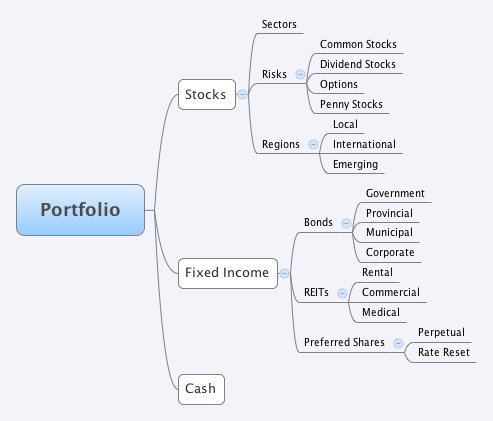 Within each, you can then diversify based on sectors and such. The real decision that you need to do is what investments you need to purchase. If you are looking at fixed income then the purchase of PWF for that segment of your portfolio can do the job. For others, it may be a junk bond ETF. The goal remains the same. As mentioned, the portfolio diversification is really important and everyone should track it. There is by sector within a stock diversification but you also need to include fixed income as well. 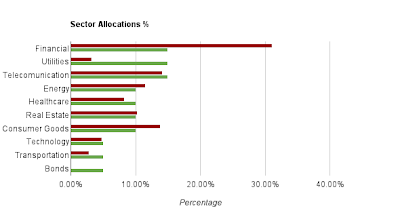 Below is my allocation target in green and my current status in red. I put together a mind map quickly to highlight the decision tree and also to assess the percentage you would want to allocate for each. It needs to be reviewed and adjusted as your finance evolve or change to make sure it’s still appropriate. As you can see, I have been covering a little more of the fixed income as it’s lacking in my portfolio above. I have obviously not mentioned ETFs or mutual funds as they actually can fall in equity, fixed income or cash. 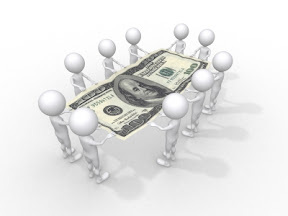 They can provide you with the diversification altogether or mirror particular areas of investing.